Next month’s going to be all about Mildura, so I’m going to keep this post short and sweet, as a taste of what’s to come. I’ve been lucky enough to be awarded the inaugural Mildura Writers Festival Residency. The residency is an initiative of Arts Mildura and the Mildura Writers Festival. During the month (July 2015) of the residency, I’ll have time and space to keep working on my current project, my second novel, The Hope Fault. As part of the residency I’ll also be writing blogs for the festival, and hosting a writing workshop or two in the community — great opportunities to make a deeper connection to the place and to the festival. 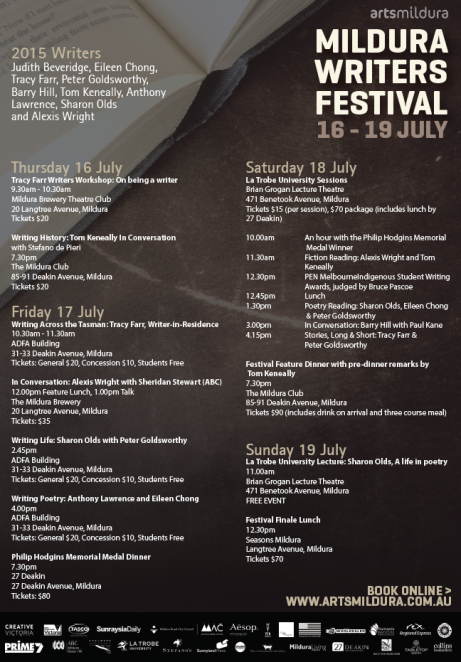 As Writer in Residence, I’ll also be a guest at the Mildura Writers Festival (MWF) from 16 to 19 July (see my sessions, below). This year is the twentieth anniversary of a festival that’s been described as “Victoria’s best-kept secret”. The impression I have of Mildura Writers Festival is that it’s small but perfectly formed. The smaller scale of the festival brings a more intimate, more relaxed atmosphere for writers and audience. Among the guest writers at MWF this year are Alexis Wright, Tom Keneally, and US poet and Pulitzer Prize winner Sharon Olds. This year’s festival will feature the announcement of the inaugural Mildura Indigenous Writers Award, presented by Alexis Wright. You can find full program details online. With my best spruiking voice: festival package tickets are available, with earlybird pricing until 19 June — book now! You can read the full program booklet online as an ebook — read the Mildura Writers Festival 2015 program here online. Mildura Writers Festival is run by umbrella arts organisation Arts Mildura. Follow them on Facebook or Twitter (@artsmildura) for news and updates on MWF2015. 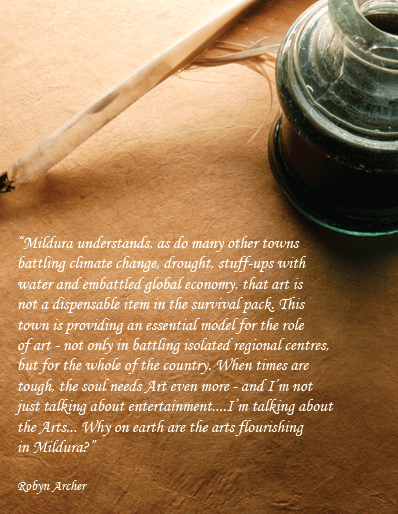 Mildura understands, as do many other towns battling climate change, drought, stuff-ups with water and embattled global economy, that art is not a dispensable item in the survival pack…When times are tough, the soul needs Art even more…Why on earth are the arts flourishing in Mildura?